Bamberg (GER) – On June 8th, 2017, the Bavarian State Agency for Viticulture and Horticulture (LWG) carried out a tasting of 10 different strawberry varieties for fruit producers at the ecological test facility in Bamberg. 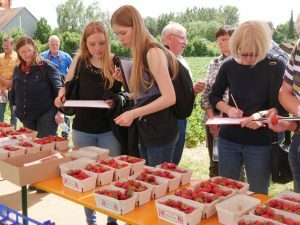 About 40 growers and consultants from all over Bavaria followed the invitation and informed themselves about innovations in strawberry cultivation. 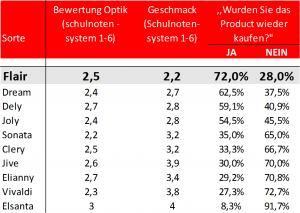 The results of the tasting are shown in Table 1. The early variety ‘Flair’ from Flevo Berry was the best according to the participants. More than 72% of the participants stated that they would buy the product again. Next were ‘Dream’, ‘Dely’ and ‘Joly’.